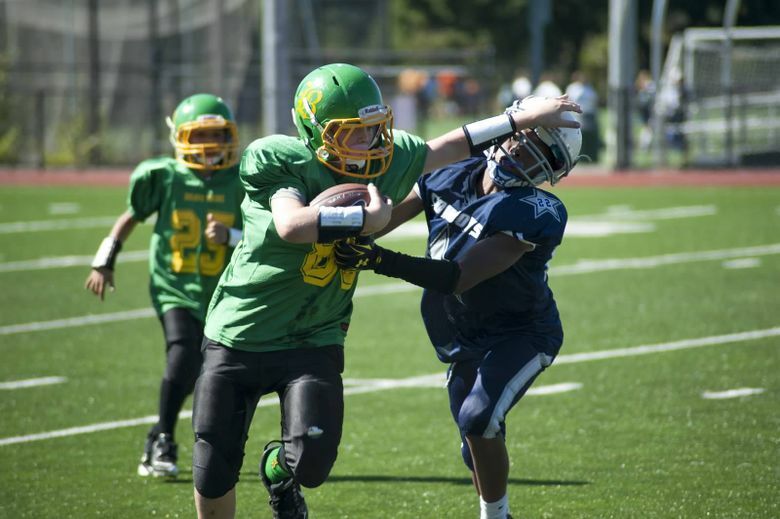 Sean Harmon, 11, carries the ball in a Brave Pride junior football game in 2014. He had recently received a heart screening. Is there a better way to identify cardiovascular conditions that may kill young athletes? The answer is “yes.” An electrocardiogram can reliably identify about 60 to 70 percent of conditions that cause sudden cardiac death. The test is simple and noninvasive. WE all want to keep our sports-loving kids safe. But is a sport physical enough? Does it really protect our children while they are doing what they love? Or is there a better way? 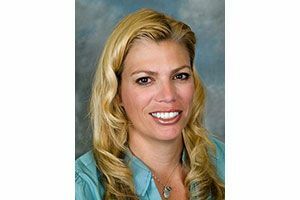 As a sports-medicine physician, a researcher in sudden cardiac death in athletes and the mother of four teenage boys who play football and basketball, I question whether the standard high-school sports physical is enough to keep our kids safe. We need to consider what the goal of the sports physical or pre-participation examination is and how it is best accomplished. Major medical organizations concerned with the care of young athletes agree that the primary purpose of the pre-sports physical is to identify potentially life-threatening or disabling conditions. And while it is well-known that the leading medical cause of death in athletes is sudden cardiac death, the current sports physical is highly unlikely to discover potential cardiac problems. Dr. Kim Harmon is a professor of orthopedics and sports medicine at the University of Washington School of Medicine and a physician at the UW Medicine Sports Medicine Center. She works with the Nick of Time Foundation. The current exam recommendations, essentially unchanged over the last 25 years, involve a questionnaire and a physical exam, including listening to the heart for abnormalities. But for 80 percent of kids, sudden cardiac arrest will be the first symptom indicating that something is wrong. A recent analysis in the Journal of Electrocardiology looked at large screening studies all over the world and confirmed that providing a history and physical were very unlikely to detect underlying heart conditions. An ECG can reliably identify about 60 to 70 percent of conditions that cause sudden cardiac death. Is there a better way to identify cardiovascular conditions that may kill young athletes? The answer is definitively “yes.” A 12-lead electrocardiogram (ECG) can reliably identify about 60 to 70 percent of conditions that cause sudden cardiac death. The test is simple, noninvasive and inexpensive. So why isn’t it a part of every sports physical? Opponents to adding an ECG to a sports physical claim that sudden cardiac death does not occur frequently enough to warrant the additional test. But don’t tell that to parents who have lost children to sudden cardiac arrest. After losing her seemingly healthy, athletic, football-playing son to an undiagnosed cardiac condition, Seattle mom Darla Varrenti has devoted her life to advocating for adding an ECG screening to pre-participation exams. Her foundation, the Nick of Time Foundation, raises money to cover the cost of providing ECG screenings for high-school students. This simple screening could have saved her son’s life. Since there is no mandatory reporting of sudden cardiac arrest in the United States, it’s unclear how frequent sudden cardiac arrest is. But a recent study in Mayo Clinic Proceedings suggests that the rate of sudden cardiac arrest and death is much higher than previously thought. A college male basketball player has a risk of death of 1 in 1,250 over a four-year career — higher than his risk of death in an automobile accident, suicide or homicide. Over the past 10 years, there were two football players in the NCAA who died of head injury. During that same time period, however, there were 78 who died from sudden cardiac death. Others argue that ECGs are not accurate. But false-positive rates for ECGs are at 2 to 4 percent when using modern interpretation standards — well within acceptable limits. In contrast, false-positive rates on currently recommended screening questionnaires are upward of 50 percent. So what should a parent do? All my kids have been screened with an ECG. It just makes sense. The benefits of participation in sports for youths are unquestionable. Mitigating risk when possible is smart. A simple, inexpensive ECG could find the majority of conditions that might cause sudden cardiac death. So when you take your budding athlete to that next sports physical, know the facts. Make sure his or her heart is safe, and ask for an ECG.